Fall at last is here, and with it we have the newest Powderwhore film, "Elevation", in which brothers Noah and Jonah Howell continue their quirky but heartfelt mission to spread the word. As you'd expect, Elevation showcases the Powderwhores' remarkable knack for finding and photographing deep snow—but it also deepens their growing interest in documenting the people who ride it. 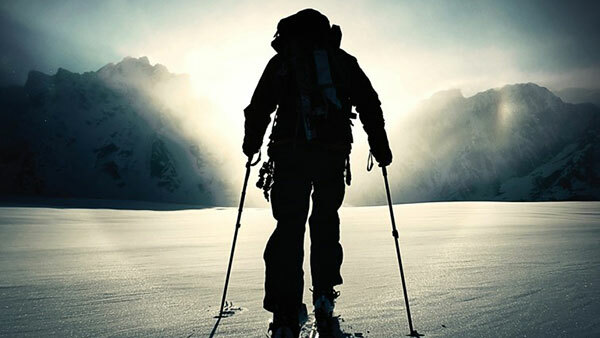 Like last year's film, Choose Your Adventure, Elevation is a freewheeling and experimental effort, focusing more on people than pure skiing. Don't worry—you'll still get your Alaskan fix, and plenty of Howell-brother humor. But you'll also be exposed to a wide range of characters who inhabit very different corners of the backcountry skiing universe. This diversity of cast was, for me, the film's greatest strength. Meet the Dorais brothers, Jason and Andy, who have an odd habit of running up summits (and I do mean running) to chase the ski mountaineering round-trip record book. Visit a Lutheran retreat hidden deep within the Washington Cascades where the locals—gasp!—don't know how to ski. How about watching Cindi-Lou and Zach Grant build their dream home—a log cabin—in the heart of the Wasatch Mtns? Or joining Andrew McLean for cutting-edge tent-cooking technique? Though they may seem disconnected, each of the film's segments visits people who live and play in snow country, inviting us to share a slice of their lives, ordinary and otherwise, and this becomes the film's common thread. If there is a danger here it's an obvious one: by slowing the pace and quieting the volume, the film risks losing the Red Bull demographic. But give Elevation a try, if you're willing. You just might find something unexpected in this understated, almost-Chekovian approach to ski filmmaking. And if not, the skiing's still pretty darn good, too. For tour dates, trailer, or to buy a copy of 'Elevation', visit Powderwhore Productions.